At times it's like I'm maneuvering in a minefield. Things blow up and I crawl out of the hole. One balmy September afternoon, the Little Red Hen sat down to read her e-mail messages. She was just completing her first month as the new principal of the Hen House, and it was already 6 p.m. Where had the day gone? After sorting through all her memos and messages, she found herself pecking out a very long “To Do” list. “Then I will write the plan all by myself,” replied the Little Red Hen. After all, the plan was due in two weeks. What would the Central Farm say if the Little Red Hen turned hers in late? “Then I will organize the reading intervention program all by myself,” said the Little Red Hen. And she found tutors, created the curriculum, and made the schedule with nary a lick of assistance! “Then I will get the Do Bees to plan our Parent Education Night,” squawked the Little Red Hen. After all, what would the community think if she were the only principal in town who didn't offer parent training? So the Do Bees—who always do everything—planned the whole thing themselves! On the last day of school Mr. Mallard, Miss Catty, and Mrs. Piggy hugged good-bye before dashing off for their summer vacations. Back in her office, the Little Red Hen was asleep atop her computer. It was no surprise that she was exhausted after such a productive inaugural year. As for the Do Bees, they were sprawled around the Hen House floor. Some were dazed and confused while others were trying to recover from broken wings and lost stingers. A few Do Bees had gathered the strength to fly south to a more peaceful and moderate climate. They told the Little Red Hen and the others around the Hen House to buzz off! The story of the Little Red Hen strikes a chord in many of us. Perhaps we've succumbed to the role ourselves, or maybe we've watched with empathy as a principal acquaintance has struggled to do all and be all. Etched in our minds is the now familiar list of reasons why it's difficult to attract and retain people in the principalship. Long hours, an excessive workload, and insurmountable expectations from several opposing factions can lead to unmanageable stress. These stressors plague nearly every principal, but beginners face the added challenges brought on by inexperience. Without a doubt, the first year of the principalship is the most challenging. One Colorado study, for example, found that stress for first-timers falls into three major categories: (1) absorbing volumes of information; (2) working for change despite significant resistance; and (3) proving oneself to others (Strong, Barret, & Bloom, 2002). Because beginning principals have yet to establish relationships and gain credibility with staff, parents, the central office, and the community, they regularly suffer from a sense of helplessness, insecurity, and fear of failure. Like our Little Red Hen, the inability of novice principals to effectively delegate and share leadership responsibilities makes them especially vulnerable. Being a school principal has been likened to being the mayor of a small town (Yerkes & Guaglianone, 1998). Although the celebrity status is a great ego boost, it comes at a price. As new principals enter the position, they adapt to the role at different rates of speed. The transition period for a beginner, also referred to as the “socialization process,” is characterized by three distinct stages: (1) the anticipatory stage, (2) the encounter stage, and (3) the insider stage (Alvy & Robbins, 1998, p. 4). The anticipatory stage commences as soon as the candidate accepts the job and starts to sever ties with current colleagues. As old loyalties are broken, new alliances are formed. When the principal looks forward to the position, yet ardently remembers previous relationships and responsibilities, it's considered “healthy leave taking.” On the other hand, when new principals struggle to let go of the past or maintain a selective memory about how wonderful things were in their former assignments, they may remain stuck in this stage. The success of beginning principals largely depends upon how adeptly they transition into their role and environment. Once newcomers are handed the keys to the school, they begin to This second transitional phase is called the encounter stage. For many, this stage is fraught with loneliness, logistical challenges, time constraints, and complex relationships. The induction period for first-timers is relatively short. If the newcomer cannot quickly understand and handle these encounters with so many different constituents, it becomes increasingly difficult to recover in subsequent years. Patterns and habits are hard to change. Success during the encounter stage is gauged by what the principal pays attention to, how the principal reacts to crisis, the principal's words and deeds as opposed to what is said, and what's recognized and celebrated (Yukl, 1998). The hope for new principals is that they progress through both the anticipatory and encounter stages by the end of their first year so that they become “insiders” in the school. It isn't until this final period of transition that staff, students, parents, and community members finally accept the principal. Trusting and endearing relationships begin to form at this stage. As insiders, principals understand and respect the culture of the school, even as they may be working to reshape it. The speed with which beginners assimilate into the insider stage is directly linked to how well they fared in the encounter stage. Although principals might retain their position for several years, what largely determines their long-term success is the manner in which they are socialized into the school. Like the Little Red Hen, newcomers bring a mixed bag of personal and professional experiences on their journey into the principalship. Personal background, such as cultural heritage, family relationships, gender, personality, and tolerance for change, coupled with their experiences as a teacher, university preparation, and previous administrative assignments, all influence principals' behavior. Rookies find their patience and confidence tested on a regular basis. They tend to take criticism and conflict personally. Running a school is a people business, and relationships are quite fragile during the transition period. Social and political maneuvering is necessary to navigate through the minefields in and around the schoolhouse. Few administrative functions in the principalship are carried out in isolation. As newcomers are socialized into the role, a major undertaking is to learn to take charge of their emotions before emotions take charge of them. Competent leaders rely on intuition to see the links among what they think, do, and say and are able to determine how their feelings affect their performance and relationships. To be respected, principals cannot keep people guessing about how they will react to a particular situation. Principals who demonstrate erratic dispositions don't last long in the job. The qualities that distinguish the manner in which people regulate their feelings, interactions, and communication is commonly known as emotional intelligence (EI). Emotional intelligence is vital in any work setting but is paramount to survival in the principalship. Although the dimensions of emotional intelligence have existed for quite some time, it is only within the last decade that leading psychologists, such as Daniel Goleman, have uncovered the correlation of EI to individual and group performance. Goleman and other researchers believe that EI counts more than IQ (Pool, 1997). Emotional intelligence functions as the pre-eminent barometer of achievement for school leaders. Principals work vicariously through others to affect student learning. Setting academic expectations, serving as a resource for teachers, guiding improved teaching practices, promoting a vision that is shaped by parents and staff, and establishing systems to encourage parent involvement are the primary ways this is done (Gordon, 2003). To flourish in this role, principals have to “turn the mirror inward” and scrutinize the internal picture they hold of themselves (Senge, 1990, p. 9). This is known as intrapersonal intelligence (Goleman, 1995). In addition, principals need social savvy or interpersonal intelligence to correctly read the body language, tone, and facial expressions of others. Job demons that haunt first-timers, such as overload, isolation, and resistance to change can be exorcised once an internal locus of control is developed. In essence, new leaders have to accept the fact that any shortcomings—along with any strengths—are a manifestation of their own effort and motivation, not the result of external forces. Through emotional conditioning, good administrators learn to remain even-keeled amidst a storm of daily chaos. They contour their responses to meet a range of constituent needs and interests. The five domains of emotional intelligence in Figure 4.1 outline the attributes that guide the thinking and actions of all principals. To strengthen each domain, rookies must learn to ask for feedback and take suggestions to heart. The ability to recognize your emotions and the effects of your moods on other people; being aware of your strengths and weaknesses. The ability to manage disruptive emotions and impulses (fear, anxiety, anger, sadness); thinking before you act; taking responsibility for your actions. The ability to channel emotions into the service of a goal; remaining hopeful even when facing setbacks; seizing opportunities. The ability to sense others' perceptions and feelings; seeing what others need to bolster their ability; listening to and validating the concerns of others. The ability to understand the emotional fibers that make up others and to treat them accordingly; the ability to persuade, initiate change, and create group synergy. Adapted from the work of Daniel Goleman and the Consortium for Research on Emotional Intelligence in Organizations. To become more empathetic, for example, principals need to understand that their position holds tremendous symbolic power. An incident in my own district offers a poignant illustration. After a month on the job, a new principal began experiencing some hostility from teachers about her disregard for traffic problems in the parking lot. The principal was confused. She thought she was doing everything right by dutifully directing the flow of cars and cheerfully waving goodbye as parents pulled away from the school. When the principal finally approached a teacher for advice, her error was revealed. Her predecessor had always greeted students where parents dropped them off in the mornings, but she was standing near the parents' exit. In the afternoon, the principal was expected to be at the parking lot exit; instead she was in the student loading area. Her choices of position slowed down the traffic pattern; once she repositioned herself, all was well. By looking inside herself, she was able to validate the feelings of teachers instead of minimizing them. We've even used the phrase “standing in the wrong place” to refer to situations that one of us has inadvertently misread. This profound “aha” helped the principal become more empathetic toward the feelings and concerns of others. To measure your propensity to respond with a level head and effectively handle workplace issues, it may be interesting to use one or more of the emotional intelligence self-assessments available. The instrument developed by Nick Hall at www.saluminternational.com.htm is especially user-friendly. After beginning principals determine their emotional resiliency, they can sit down with a mentor, peer, or supervisor to create a plan for self-development. Keep in mind that emotional intelligence isn't just about professional success; it's about life success. By raising our EI, we all have the potential to become healthier, happier people. How does Lance Armstrong peddle faster, Tiger Woods perfect his swing, and Serena Williams dish up a fast-acing serve? Commitment, confidence, and control—all derivatives of EI—play a major part in the prowess of these athletes. To reach and sustain peak performance, however, world-class athletes also rely on the tutelage of a coach. Masterful coaches inspire people to “recognize the previously unseen possibilities that lay embedded in their existing circumstances” (Hargrove, 1995, p. 43). The goal for all top competitors is to have their best performance when it counts the most, therefore, skilled coaches work from the inside out to propel their protégés into the “zone,” that special place where athletes weave a web of concentration and shut out all distractions. While in the zone, actions and decisions are effortless. Timing and tempo fit like a glove. Self-criticism is nonexistent. It is here that players take their game to the next level. Recognizing that they will be perceived and treated differently as a principal than they were as teachers. Making the emotional leap from supervisor of students to supervisor of adults. Learning to live under the spotlight; “celebrity status” requires giving up privacy and freedom. Letting go of emotional responses to problems. Giving up the need for perfection and control. Accepting that the job is never finished. Investing in their own well-being through the pursuit of interests and relationships outside of school. Comfortably handling relationships with people in authority (superintendent, board, and high-level administrators). Balancing relationships over productivity by keeping conversations short, yet still meeting the emotional needs of the other party. Navigating unfamiliar landscapes with diverse clients to develop cultural sensitivity. Intensive coaching and induction programs are the best ways to support a principal's early years. Formal coaching not only improves the retention rate for beginners, it catapults them through the transition period. According to Robert Hargrove, “Coaching is about interacting with people in a way that teaches them to produce often spectacular results in their businesses” (Hargrove, 1995, p. 1). A coach sees what others do not and then applies specific strategies to enhance his client's perceptions. Expanding this space of possibilities for rookie principals means it's only a matter of time before they, too, can experience the magic of the zone. New principals are not fully prepared to assume their duties without major support. Becoming an effective site principal is a developmental process. Effective coaching relationships are highly individual. New administrators do not necessarily know how to take advantage of coaching. Any program that supports new principals has to be respectful of the demands for time and attention already placed upon them by others in the organization. Coaches must be competent, trained, and available full time. The winning CLASS formula uses blended coaching techniques to teach new principals. Trained coaches guide clients by relying upon both instructional and facilitative strategies. Instructional coaching focuses on “showing and telling.” In this method, the coach may provide direct advice, access to resources, or modeling of tasks. Instructional techniques are best applied when the principal's needs are simple, operational in nature, and time-bound. Facilitative coaching, on the other hand, is more sophisticated. The facilitative strategy is most appropriate when the novice has adequate background knowledge and experiences and there is a stronger chance for “prolific learning.” In essence, the principal has to be able to recognize how his own assertions or biases are influencing a situation before he can modify his behavior. In the facilitative approach, the principal is molded into a reflective practitioner by looking beneath the surface for the causes of a problem, rather than focusing on the symptoms. Instead of proclaiming “Test scores are low in that class because the teacher is lazy,” the principal is prompted to uncover what might be hindering the teacher's motivation. Facilitative coaching addresses issues related to the principal's emotional intelligence and disposition. Reducing a newcomer's natural tendency to become defensive or place blame on others when things don't go well is a prime example. As the coach poses clarifying questions, the principal discovers that talking less and listening more may change the outcome. This is transformational learning, which indisputably hastens the effect novices have on student learning. When the principal's observations and responses are grounded in data as opposed to assumptions, positive instructional changes are the obvious result. The three-day CLASS workshop teaches prospective coaches how to identify and use each strategy with their new principals. Coaches learn about collecting data that is centered on induction research and principal needs. Log sheets, goal-setting forms, and toolkits are available to guide coaching conversations, build trusting relationships, and measure progress. The idea is for the coach to concentrate on immediate issues and concerns as well as on the principal's long-term professional development. Included in the CLASS training material are participation agreements and protocols to explain the program to the superintendent, faculty, colleagues, and parents. It's imperative that novice principals and key stakeholders clearly understand that the program is designed as a proficiency, not a deficiency, model. In other words, coaching is meant to sharpen a principal's inclination toward learning leadership, not correct performance deficits or concerns. NAP recommends that coaches be available during the school day and that they come from outside the district. This guarantees confidentiality, ensures a neutral perspective, and prevents conflicts with the coach's time. Coaches are required to meet with first-year principals at least once every two weeks, and second-year principals every three weeks. A full-time coach is capable of working with as many as 20 first- and second-year principals, although 12 to 15 clients would be best. As districts investigate the implementation of a coaching program for their new principals, the benefits should be weighed against the costs. Greater retention rates in the principalship, higher morale, and enhanced confidence all make for more effective principals. Tomorrow's champion principals will be those who are “mobilized into action” by constantly learning, adapting, and stretching goals to bring about real change (Hargrove, 1995, p. 89). It's impossible to have exemplary schools without exemplary leaders. First- and second-year principals deserve the chance to become exemplary leaders by training with a masterful coach. From Bacall to Baryshnikov, Pavarotti to Pacino, every great performer has a coach. Although coaching is undoubtedly the best formula to help novices develop into winners, valuable support systems can be installed to build a strong base. Buddy programs, mentoring, and principal academies provide additional cogs in the wheel of support. As new principals come aboard, veteran principals can be enlisted to serve as buddies. A buddy's role is to give advice and encouragement on daily issues and problems. Outreach may come in the form of telephone conversations, e-mail correspondence, site visits, or job shadowing. Seasoned principals, who know the ins and outs of the district culture, are a great sounding board. They also have expertise in handling district protocol and procedures, which may be beyond the realm of an outside coach. Veterans regularly experience an increase in their own job satisfaction and leadership development as a result of working with a novice. Educators know that when we help someone learn, we often learn more than the person we're teaching. Buddy programs, then, are a two-for-one deal in enhancing principal effectiveness. A central office mentor is another good resource to bolster support for a beginner. The ideal mentor is a former principal who works at the district office, but does not act in a supervisory capacity to the principal. District mentors can easily relate to the obstacles unwittingly imposed by the central office and have access to a network of people and inside information. Because most new principals are reluctant to call the central office for guidance, an assigned district mentor offers permission to do so in a safe, nonjudgmental context. Having served in this capacity for four years, I can attest to the value of a district-level mentor. Simple suggestions like “The budget department is really busy working on the year-end report. How about if I go around the corner and check with them for you?” can mean a lot to a beginner. Helping new principals understand whom to call, when to call, and when not to call is invaluable. Providing this bridge to other departments significantly lowers newcomers' anxiety as they attempt to broaden their knowledge and experiences. Finally, districts must actively endorse the participation of first-timers in principal academies and at state and national conferences. The Harvard Principal's Academy and other summer institutes for new and aspiring principals are an excellent way to affirm and rejuvenate beginners. Networking with others in similar circumstances is reassuring to novices and helps them to put the job in perspective. Academies also generate self-respect and recognition for the work principals do. 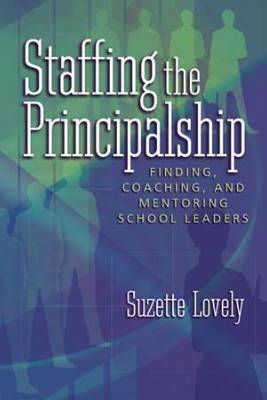 Chapter 5 examines ways of expanding the professional competence and confidence of principals. By providing a new frame of reference, they may discover untried options and choices. These fresh possibilities become the catalyst for new skills, capabilities, and actions (Hargrove, 1995). Champion athletes develop fitness and strength gradually. They coax their bodies to handle greater stress with greater ease through low-intensity workouts before applying anaerobic efforts. How many runners attempt a marathon if their longest training distance is only 10K? Coaches, buddies, mentors, and academies are ideal for helping rookies develop and grow. The cornerstone of any successful coaching program is to assist participants in building a strong confidence base to withstand the pressures of the principalship. The idea is to lead the beginner into the zone for peak performance. Once inside the zone, a spirit of triumph will prevail, as seemingly unobtainable tasks become manageable and easy. Effective “principaling” calls for principled leadership. Maintaining integrity and trustworthiness reaps tangible rewards. When trust is present, the principal is treated as an insider and high-quality relationships blossom. When trust is absent, problems arise. It's not what principals do that creates career-ending consequences, but rather what they don't do. Poor interpersonal skills are the biggest reason why principals fail in the job. Newcomers, then, must pay careful attention to the perceptions of others and need regular feedback about how they are being perceived. Great sports heroes excel not just because they possess exceptional physical attributes, but because they avoid self-sabotage, heed the advice of others, and continually reinvent themselves. The competitors our society admires most take things one step further by skillfully activating the talents of their teammates. As beginners give rise to their winning combination of leadership, they must strengthen intrapersonal and interpersonal skills to galvanize their success during the induction period. Novices should concern themselves with doing the right thing instead of doing things right. Balancing technical competence against personal competence calls for common sense, emotional stability, and moral leadership. New principals need to be aware that sometimes the best intentions can have a negative affect on people—just as my colleague found out by standing in the wrong place to greet parents and students. What one person considers right, another may consider wrong. Therefore, principals have to constantly ponder the outcome of their actions. Leadership emanates from a blend of personal attributes and characteristics. Transforming the learning and working conditions in a school through persuasion, fairness, and ethics is not an easy feat for any principal but is especially difficult for a rookie. To foster a positive and thriving school climate, these practical principles round out the playbook for first-year and second-year principals. Through practice and refinement, new principals will gradually begin to trust and believe in themselves. Never leave rules to chance. —Have clear and precise rules for adults as well as students. —Don't play favorites. Apply the rules fairly. —Don't be sidetracked or misled by workplace gossip. Refuse to adopt a cynical attitude toward staff. —Take the high road and be an advocate for people when no one else will. —Remember you're not expected to know everything. Don't let yourself be backed into a corner trying to explain or justify a decision. Don't assume others will give you feedback. —Ask for feedback about your performance and let the staff know what you're working on. Never lose sight of the need to plan and organize. —Poor organization undermines your effectiveness. Adhere to time schedules, have agendas for meetings, and keep track of everything. —Model the way by setting high standards. Expect the best from everyone, including yourself. Do not tolerate rude behavior from those who work in your office. —Front office staff set the tone for others. Demand courteous and sensitive behavior. Forget trying to do everything yourself. —Empower others to take responsibility and to make decisions. Learn to delegate! Avoid change simply for the sake of it. —Find what works well and build on it. Change only those things that detract from the school's mission and goals. Leave your previous school culture behind. —Don't try to transfer your old culture to your new school. Incorporate changes slowly. Be careful not to get carried away by the power of your position. The story of the Little Red Hen teaches us that first-timers often lack the self-assurance and wisdom to be top contenders in the principal's ring. The transition period for beginners is relatively short and imposes obstacles as the principal is socialized into the new role. Relationships between the principal and stakeholder groups are especially fragile during this initiation. Mental fortitude and emotional balance require deliberate support during a principal's first two years on the job. As rookies suit up for that big game we call the principalship, they must willingly accept guidance from coaches, peers, district mentors, and outside training sources. It takes time, practice, and endurance to reach the pinnacle of efficacy.